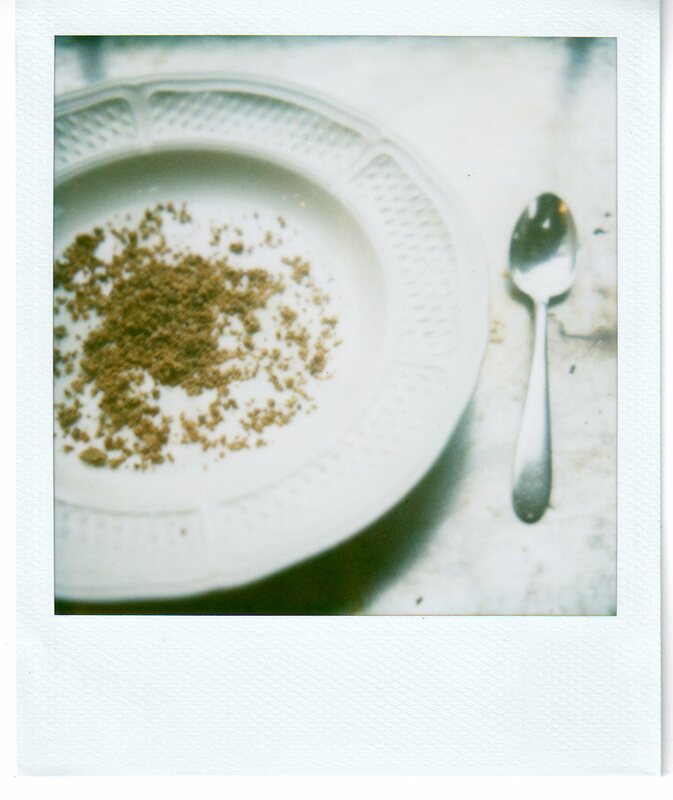 I don't know anyone who loves grape nuts the way you do. I don't know anyone so faithful, so reverent, so unwavering in their support. There is no one so apt to drop what they're doing—a plate of scrambled eggs, steamy garlic spinach, a bowl of peppermint stick ice cream—for this humble food. You love them, of course, in a particular way: with plain yogurt, a little bit of skim milk, chopped sweet apples, and a sprinkle of raisins on top. You like them for breakfast on the days when things are regimented—work, run, play. You like them after dinner, for dessert, milk and yogurt perfectly swirled to form a thin, silken cascade. You drop the cereal in at the last minute—splash!—so that it stays crisp. 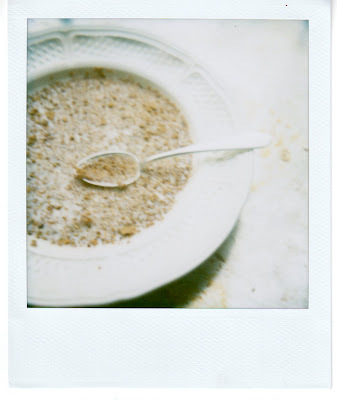 And those last few bites when you get to the bottom—when the milk and yogurt are almost gone, and all that's behind are a few grape-nuts-gone-mush—pooled, huddled in the center of the bowl—you appreciate that, too. You don't leave them behind, but rather, lift them up with the curve of your spoon. I thought you should know that I made grape nuts today. (I know! It is hard even for me to believe.) But I found them in Kim Boyce's new book, Good to the Grain, and I thought that I should give them a whirl. I didn't have what they asked for—no graham flour, only half the buttermilk—but it turns out, they aren't a picky food. I ground down some Zorro winter wheat coarsely—graham flour is, after all, only an amalgamation of its parts—and cut the recipe in half. I sprinkled in cornmeal and brown sugar, baking soda and salt, a big wet bowl of buttermilk, vanilla, honey. I wasn't quite sure if it would all work out (grape nuts, after all, are your thing), but I fired up the oven and spread them, paddled them, across the pan anyway. The jam spreader made them smooth, and on the baking sheet in the oven they browned evenly, dark. I broke them up with a rolling pin, and what emerged was a cereal: deep mahogany, burnt sienna, cacao. I ate it for breakfast cold, with a pour of chilly milk, and sat down to write you the good news. The flour in this recipe is a bit tricky. I made mine with our KitchenAid grain grinding attachment; I ground down whole grains of winter wheat first on the coarsest setting, then on a setting mid-way between coarse and very fine. If you do not have access to whole (literally un-ground) wheat grains or a grain grinder, you can substitute graham flour. Graham flour is made by grinding the endosperm and the bran and germ of wheat grains separately. The endosperm is ground finely, essentially into white flour, and the bran and germ are ground coarsely. The two parts are then mixed back together to form a flour with a nice coarse, flaky texture. (In contrast, whole wheat flour is made by grinding all three components together into a fine flour.) I was able to approximate this texture by only grinding my whole wheat "half way." You can also make an approximate substitute for graham flour by mixing 2/3 cup all-purpose flour, a scant 1/3 cup wheat bran, and 1 and 1/2 teaspoons wheat germ for every cup of graham flour. Preheat the oven to 350 degrees F. In a large mixing bowl, whisk together the "graham flour," cornmeal, brown sugar, baking soda, and salt. Set aside. Pour the buttermilk into a smaller bowl and whisk in the honey and vanilla until smooth. Pour these wet ingredients into the dry ingredients and mix to form a batter. Butter a cookie sheet. Spread the batter thinly across the pan, using a spreader or flat cake spatula to form a smooth, even sheet. (Any too thin or too thick patches will cook unevenly.) Bake for 20 minutes, turning the pan 180 degrees halfway through. Take the pan out of the oven and break off any pieces of cracker around the edges that look dark and dry. Set these pieces aside to cool, turn the oven down to 225 degrees F, and return the cookie sheet to the oven. Bake for another 30 to 40 minutes, checking on it every 10 or 15 minutes and continuing to break off any brown spots, until the cracker is a deep mahogany brown. It should also be very dry. Break the cracker sheet into pieces, and set it on a wire wrack to cool. Lay out the cooled cracker pieces on your counter and roll over them several times with a rolling pin; crumble any large pieces that remain by hand. Store in an airtight container, and enjoy as cereal with cold milk. i've never been the biggest grape nuts fan, but after reading this, i'm afraid i might be converted! thank you thank you thank you. 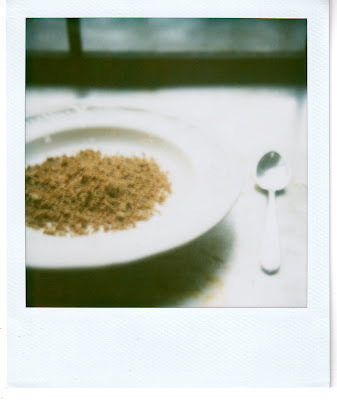 I have loved grape nuts since I was a kid and now I can forgo the industrial box and make it from scratch. small bites: it's easy, frighteningly easy, to be converted by these grains. give them a try, and you'll find yourself eating them for breakfast every single day. on the bright side, your dairy consumption will take a serious hike. alpha andy: you are so welcome. i know exactly how you feel. it is always a good feeling to discover you can make something you thought was only store-bought from scratch.